From simple light fixture installation to complex rewirings, William Thome is here to help. 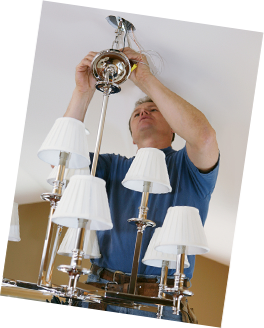 William Thome provides a wide range of residential electrical services. Our technicians are trained in the latest electrical standards to ensure you home is safe and secure. From wiring services, to fan and light installation to smoke and carbon dioxide detectors, we are ready to help make your house a home. Wm. Thome can help with all your home electric needs. Work quickly to troubleshoot and address your electrical concerns. Experienced in all types of homes, including historical and custom. Identify and address issues such as flickering lights, problematic outlets, or power loss. Upgrade your old, outdated, or undersized panel with a new 100, 200, or 400 amp service. Add on to existing service with a subpanel to accommodate any additions or renovations to your home. Add protection to your home with a whole house or individual surge arrestor. We address all of your lighting needs, indoors and outdoors. Examples include: accent, under cabinet, spot, landscape, and recessed lighting. Offer energy efficient lighting and many options to control those lights. 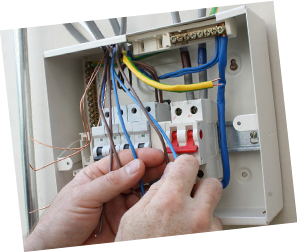 Remove old wiring, including knob and tube, and ungrounded or unsafe wire. Replace damaged or frayed wires. Install or replace outlets and switches. Ceiling fans offer added comfort and energy savings to your home. Install ceiling, bath, attic, and whole house fans. Repair existing fans. These detectors protect your family and home. Devices should be tested monthly and batteries should be replaced every year. Devices should be replaced every 10 years, even if still operable. Wire and mount televisions and surround sound systems. Run co-ax, HDMI, communication, and data CAT 6 cables. We are ready to help you with all your home electric services and solutions.